to reveal their long-hidden natural beauty! A great hobby for beginners...a great tool for experts! Create stunning jewelry with gem-like polished stones. Stimulates an interest in natural science! 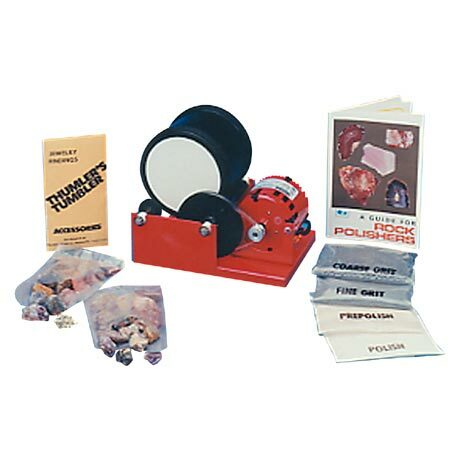 Professional quality rock polisher with a 3lb. capacity tumbler. The Model A-R1 tumbler has larger motor than the Model T.
earrings, key chains and more. Overload protected--if motor overheats, unit automatically shuts off. Tumbler is able to run for approximately 7 days (24 hours a day). A colorful Rock Polisher's guide booklet. Thumler's Tumbler - Tru Square, Fine Grit, 1lb.